Research by UC Cooperative Extension advisor Scott Stoddard is aimed at making sweet potatoes an even more healthful and attractive food. 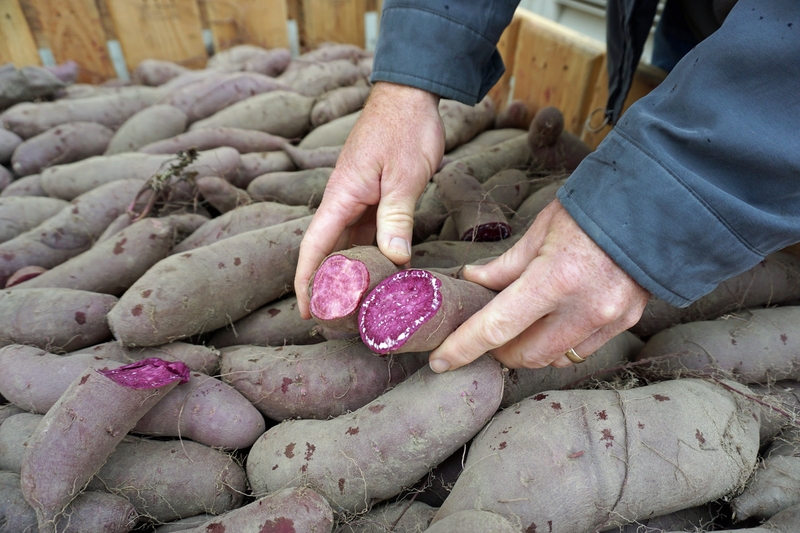 Stoddard is working with sweet potato growers in Merced County to see if sweet potatoes with dusky purple skin and vibrant purple flesh, called purple/purples, can be grown by more farmers in California. The unusual color and health benefits command a higher price, opening a potentially profitable niche market. California is a significant producer of sweet potatoes. About 80 percent of the California crop – 16,000 acres – is grown in Merced County, on farms ranging from 5 acres up to several thousand acres. In 2015, the crop's value in Merced County was $195 million. About 1,000 acres are grown in Kern County and 2,000 acres in Stanislaus County. These locations have the sandy and sandy-loam soils ideal for sweet potatoes to develop their distinctive shape and smooth skin. The white skinned, purple flesh sweet potato, left, is the Okinawan variety from Hawaii. On the right is a rainbow of sweet potatoes that are part of Scott Stoddard's experiments. Sweet potatoes with purple flesh are not common, but they have been around for quite some time. They are the main type of sweet potato grown in Hawaii, for example. Several years ago, growers in Stokes County, N.C., selected a particularly beautiful and tasty cultivar, naming it the Stokes Sweet Potato and marketing nationwide with Frieda's Specialty Produce. 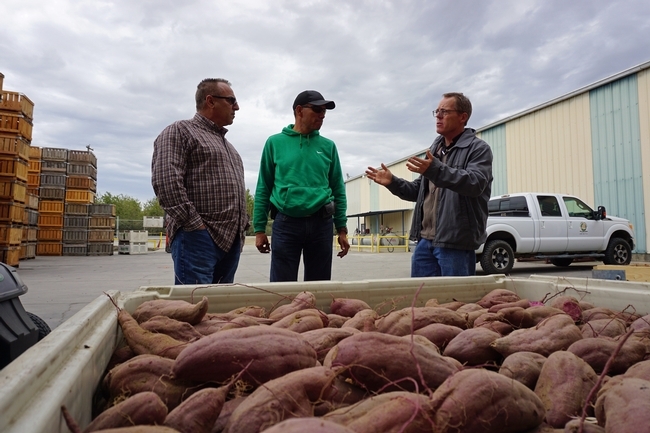 In California, A. V. Thomas Produce in Livingston acquired an exclusive agreement with the company to grow and market Stokes purple/purple sweet potatoes. 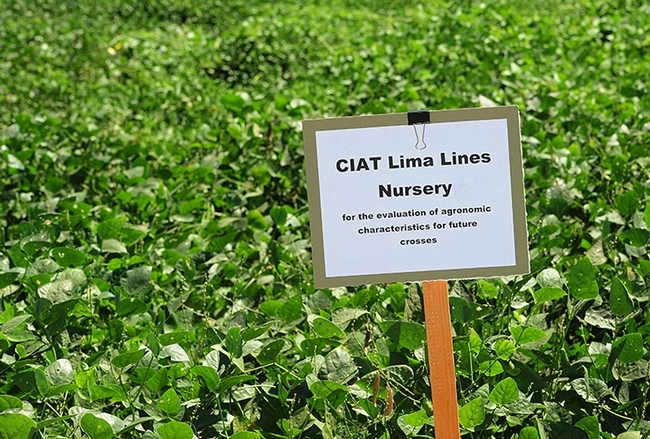 “The number of acres of Stokes has really expanded in just a few years,” Stoddard said. "There is a lot of consumer interest in purple-fleshed sweet potatoes." Scott Stoddard, right, discussed sweet potato variety trials with A.V. Thomas Produce supervisor Frank Lucas, left, and field manager George Guitierrez, center. That doesn't close the door on purple/purples for California's other growers interested in the niche. 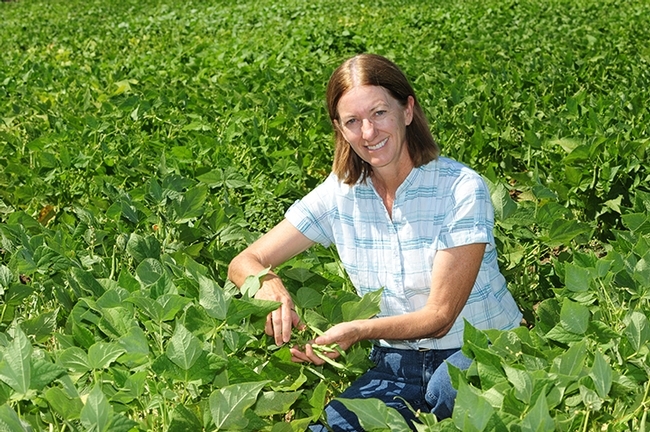 Stoddard conducts field trials in cooperation with local farmers that include purple/purples. In one trial, 50 types of sweet potatoes of many different colors are being grown to determine whether they have key characteristics needed for local production. From there, he selects a limited number to grow in replicated trials, to determine their potential to produce a high yield, store well, and develop good size, shape, color and flavor. Of these, only one purple/purple made it into the replicated trial. 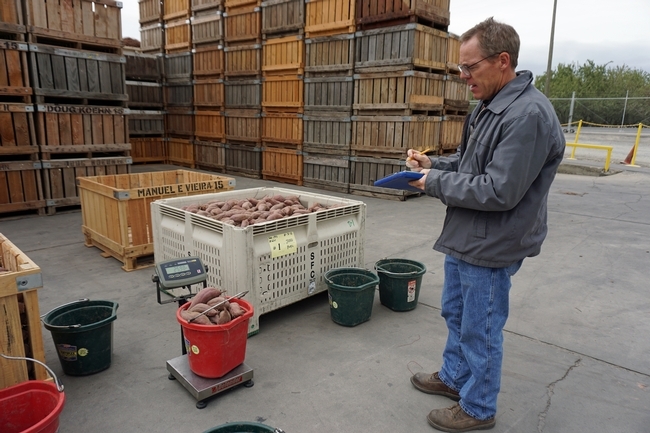 Scott Stoddard weighs sweet potatoes as part of the variety evaluation process. One of the cultivars in Stoddard's study, which goes by the experimental code number L-14-15-P, was bred in 2014 by Don La Bonte, a plant breeder at Louisiana State University, Baton Rouge. The potato has some good attributes, but lacks the uniform deep purple color of the Stokes variety. “Unfortunately, it's probably not good enough to displace Stokes,” Stoddard said. 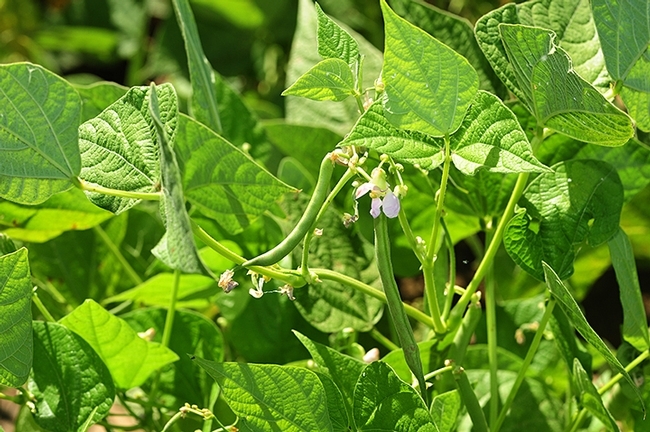 “It's a good start, but we have to continue screening purple/purples to find a variety that offers disease resistance, good yield, and consistent deep purple flesh color." Sweet potatoes can be eaten raw or cooked. To eat raw, simply peel, cut into sticks and serve with low-fat ranch dressing or apple sauce for dipping. 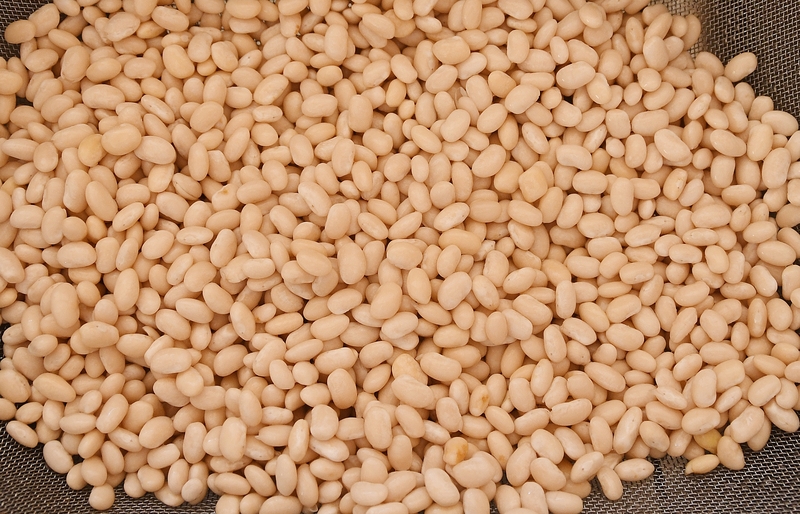 Grate fresh, uncooked sweet potatoes and add to burritos or tacos or sprinkle on salads for a sweet, nutritious crunch. Cooked sweet potatoes can be eaten for breakfast, lunch or dinner, skin and all, plain or with a small pat of butter. Microwaving is a great way to quickly prepare the vegetable. Wash potatoes and pat dry. Prick skin with a knife in 2 to 3 places. Cook on high for 5 minutes. Turn over. Then cook for another 5 minutes, more or less. UC Cooperative Extension's sweet potato expert Scott Stoddard says he prefers his sweet potatoes baked. Sweet potatoes are mostly starch, but have a special enzyme that breaks down starch into maltose when cooking. Slower cooking in the oven provides time for the conversion, imparting a subtly sweet caramelized flavor. To bake, preheat the oven to 400 degrees. Line the lower oven rack with foil, then prick sweet potatoes with a fork and place directly on the middle oven rack, above the rack with foil. Bake 45 minutes for sweet potatoes 2 to 3 inches in diameter. Visitors are briefed before entering the persimmon variety block to taste and harvest persimmons. 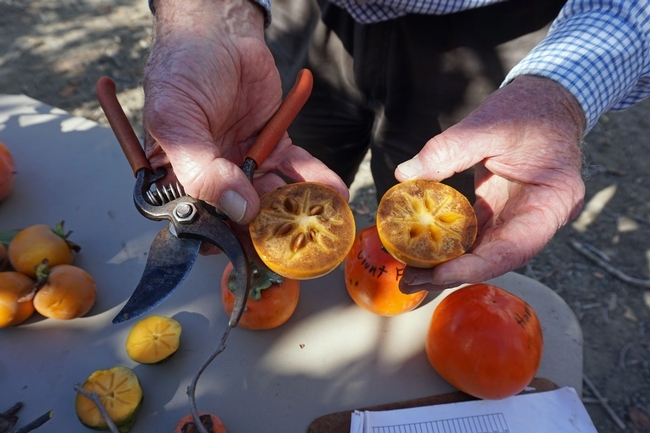 The persimmon collection came to the research center in the 1960s, when the late UCLA subtropical horticulture professor Art Schroeder arranged to move his collection of persimmon varieties to another venue because the pressure of urban development at the Westwood campus became too great. Persimmons are native in two parts of the world, China and the United States. The Chinese persimmon made its way to Japan, where its popularity soared. The American persimmon comes from the Southeastern United States, however, most California persimmons trace their lineage to Asia. California leads the nation in persimmon production, according to the California Department of Agriculture Crop Report, but with a value of about $21 million in 2012, it represents just a small fraction of the state's $19 billion 2012 tree fruit and nut value. 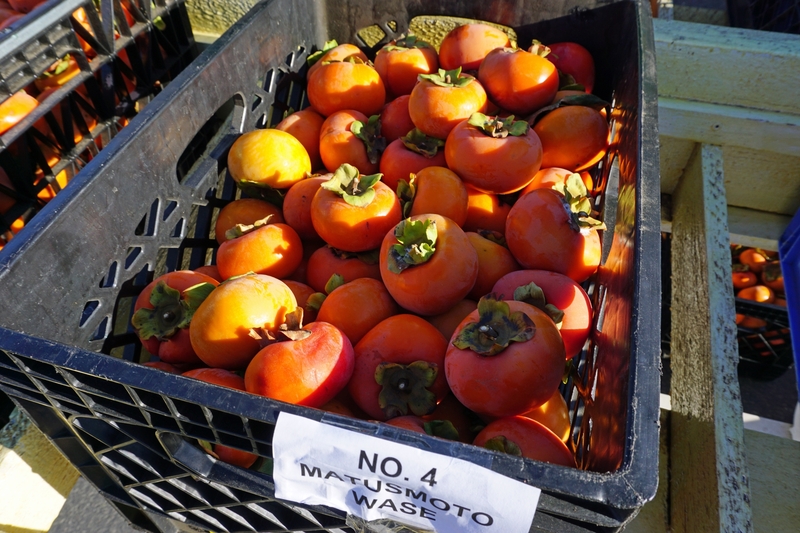 A display of fuyu-type and hachiya-type persimmons helped participants distinguish which fruits are ready to eat. Nevertheless, to the visitors who came out to tour UC's collection at SCREC, persimmon is a choice fruit. 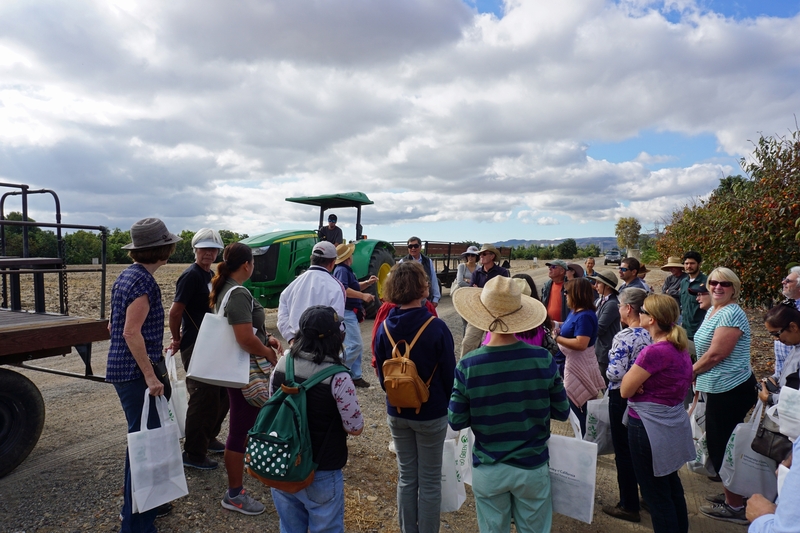 Participants on the early-morning VIP tour received a large shopping bag to fill with various varieties of fuyu and hachiya persimmons. Fuyu are flat, yellow-orange fruit that can be eaten right off the tree like apples or allowed to mature to a super-sweet soft pulp. Hachiya are redder, heart-shaped and astringent when not fully ripened. “If you bite it, it will bite your mouth right back,” said one participant. However, after ripening to a jelly soft pulp or dried, the hachiya is equally delicious. Shirley Salado, supervisor of the UC Cooperative Extension Expanded Food and Nutrition Education Program in San Diego County, attended the persimmon field day to collect persimmons and information about the healthful fruit. 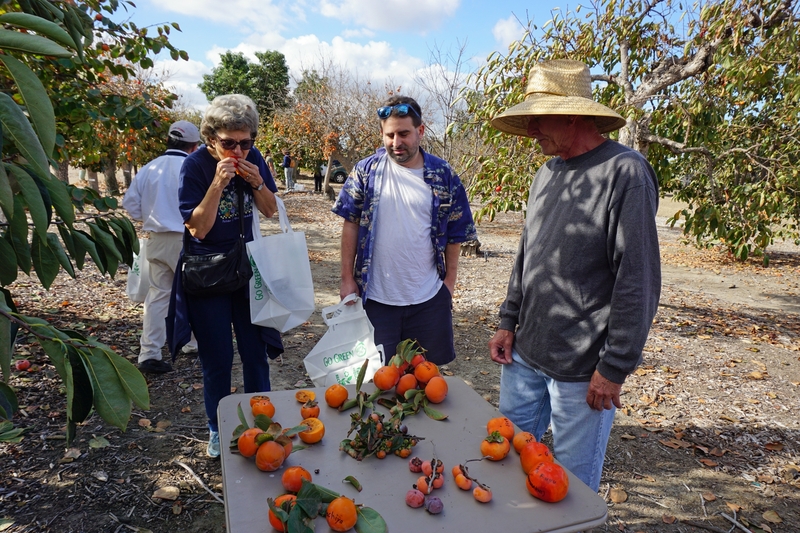 Shirley Salado, the UC Cooperative Extension Expanded Food and Nutrition Education Program supervisor in San Diego County, attended the persimmon tasting to gather fruit and information for her education program. Salado collected two large bags of persimmons to share with her nutrition education staff. Jean Suan, right, plans to dry her persimmons using the traditional Japanese hoshigaki method, in which the whole fruit is peeled, as shown on the left, then hung on a string outdoors. For several weeks, the fruit is massaged every few days, until the sugars form a frost-like dust on the surface. 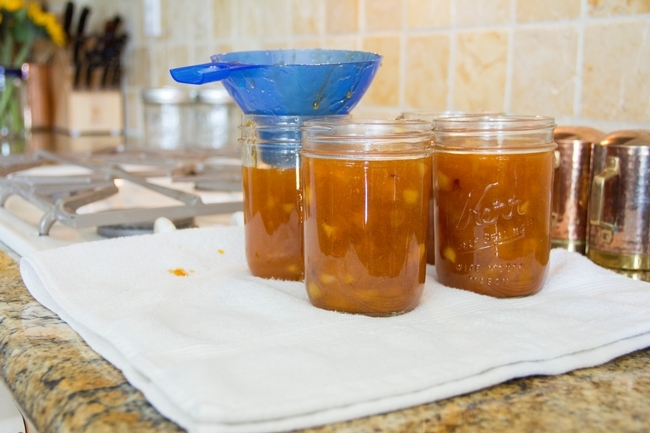 The result is fruit with date-like texture and strong persimmon flavor. 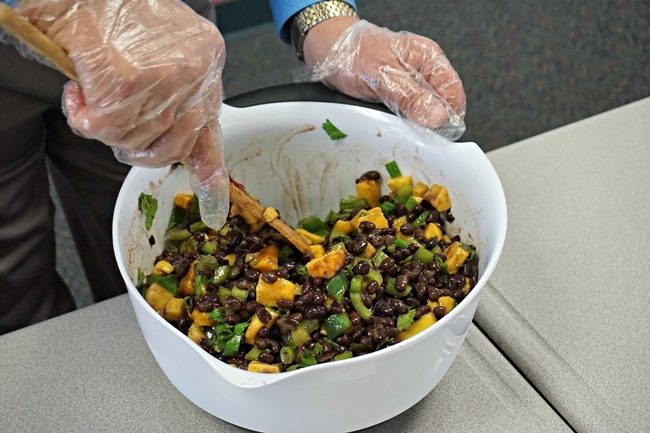 Following the tour, coordinator of the UC Master Food Preserver program at SCREC Cinda Webb demonstrated safe consumption by making cinnamon persimmon jam, dried persimmon chips, and a gourmet persimmon, basil, beet and rice salad. 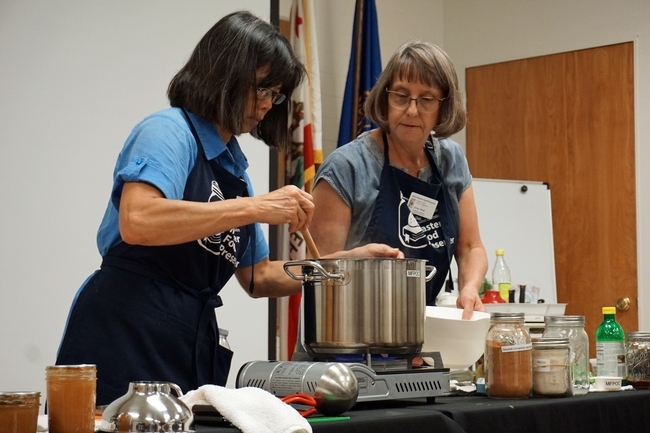 UC Master Food Preserver coordinator in Orange County Cinda Webb, right, and Master Food Preserver Mabel Alazard, make persimmon jam. Stir basil, beets, persimmons and feta into rice and toss with ½ cup vinaigrette. Top with persimmon slices and extra chopped basil for presentation. A member of the Rare Fruit Growers Association, Dewey Savage, showed a fuyu persimmon with browned flesh. The browning is caused by alcohol released by the seeds inside the fruit. The alcohol neutralizes tannins that make the persimmon astringent. The natural chemical reaction results in sweeter fruit. UC Master Gardener volunteers prepared persimmons for the variety tasting. 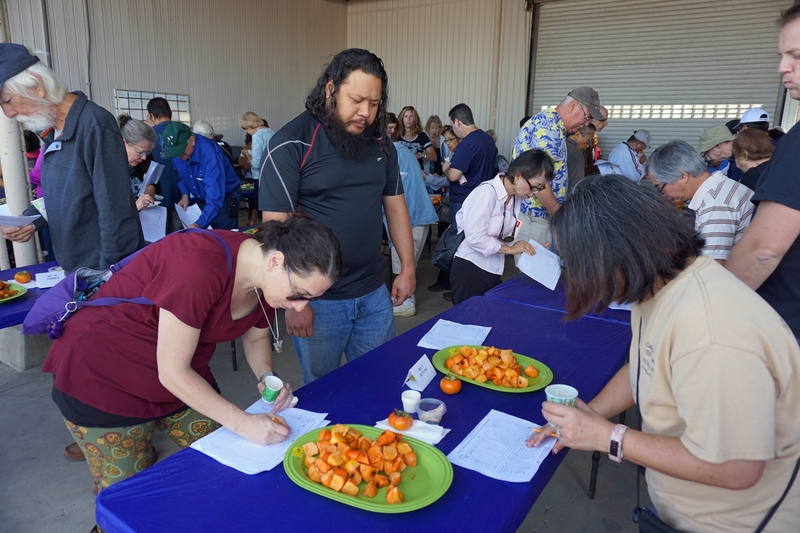 Participants evaluated persimmon varieties based on attractiveness, astringency, sugar, flavor and overall performance. Portion control: Thanksgiving is about choices. Think about which dishes you don't mind skipping, and plan to fill your plate only once. It's easy to get carried away going back for second and third helpings. Fruits: Get your serving of fruit with a fruit-based dessert. Baked apples, poached pears and fresh figs are a few festive options. Grains: Use whole grain or 100 percent whole wheat bread for a stuffing rich in fiber. Protein: Serve yourself 3 ounces of roasted turkey or a portion the size of your palm. 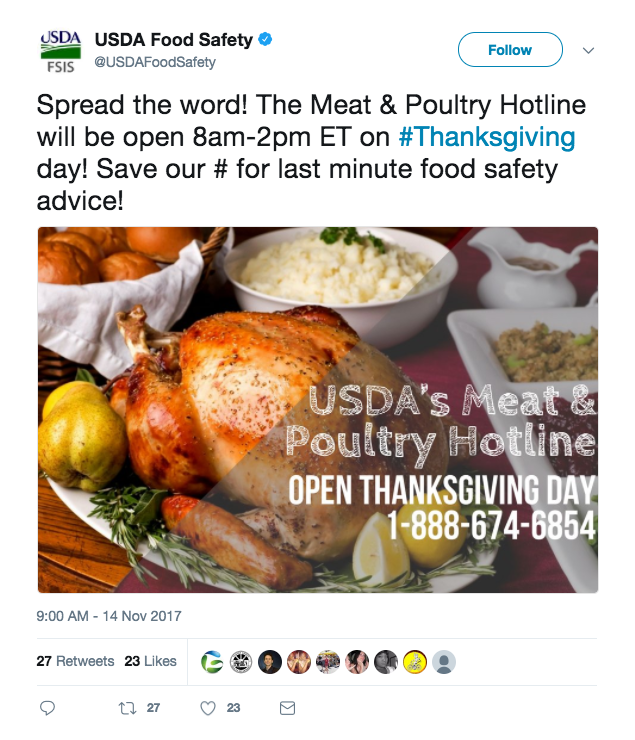 Skip the fat by removing the skin on your turkey before eating it. Go easy on the gravy. Vegetables: Choose vegetable side dishes that include roasted or cooked vegetables, and skip the creamy sauces and added fat. Instead, season vegetables with fresh herbs to add flavor. Dairy: Try non-fat Greek yogurt as a healthier topping for side dishes than sour cream or butter. Don't forget to be active. After the holiday meal, go for a walk, bike ride or play football with the family. Not sure what to do with your leftovers? 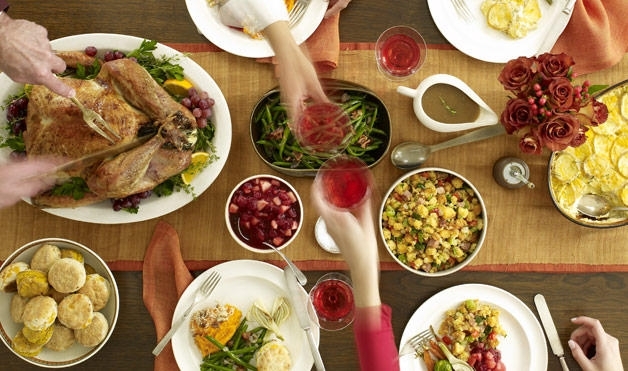 Reinvent your Thanksgiving feast with these quick and easy one-sentence leftover recipes. Whirl cranberries with frozen low-fat yogurt and orange juice. Toss cubed turkey with celery, apples, and light mayo with shredded spinach. Mix stuffing with egg and cook thoroughly, pancake-style. Wrap sliced turkey, spread with cranberry sauce and shredded greens in a whole wheat tortilla.